604 Neighbourhoods is a weekly series appearing on the Inside Vancouver blog that will feature photos, history, and information about some of the city’s most distinct communities. 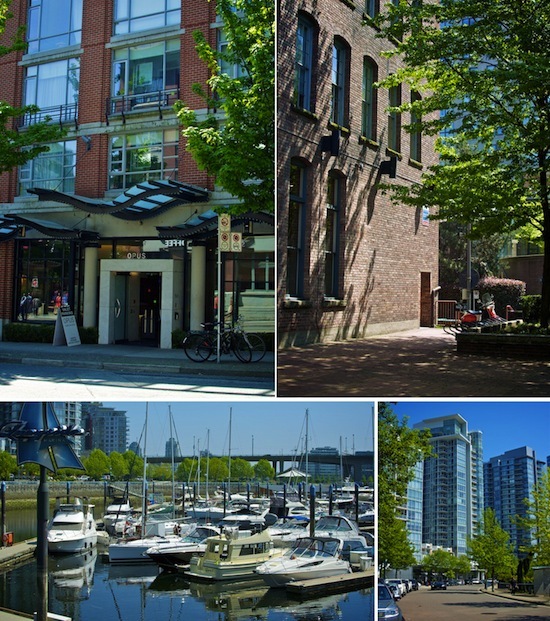 Today’s feature is Yaletown, located within the downtown peninsula it is bordered by Homer Street, Robson Street, and False Creek. 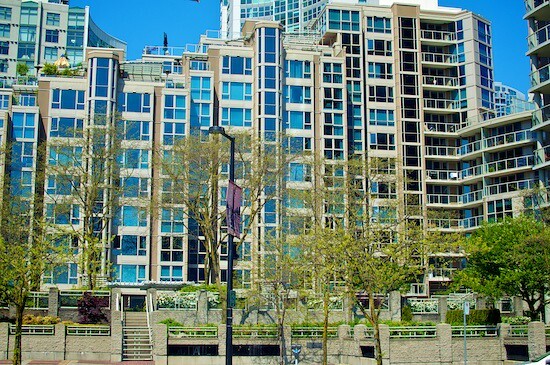 Yaletown’s marriage of old brick warehouses and shiny glass towers combine to make it a harmonious live/work community. Taking a stroll through Yaletown you’ll pass children playing in David Lam Park, cyclists on the Seawall (that connects around False Creek and also up to Stanley Park), and office workers on cafe patios during their lunch breaks. You can grocery shop, rent a bike, see a play, or watch boats come in and out of the marina. 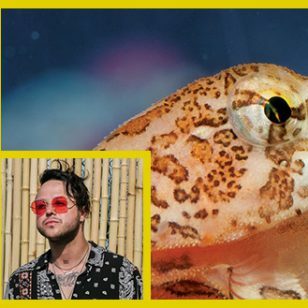 Technology start-ups occupy warehouse buildings, families walk their children to school, and the streets come alive after dark with late-night diners hitting some of the city’s hottest lounges. “I have lived and worked in Yaletown for the most part since 1999,” Breikss told me. 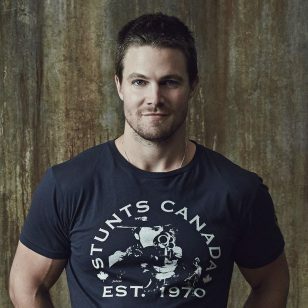 “At that time I got a job at a dot-com and I moved out of my parents house and into my first apartment in Yaletown with a roommate.” Breikss went on to start up his own company three years later, from that apartment. 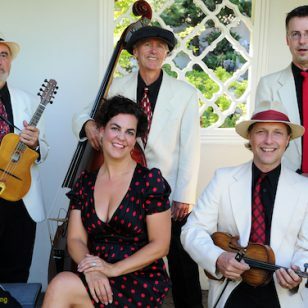 After over a year in the 200 square-foot solarium, they decided to expand. “We posted posters throughout Yaletown saying “Office Space Wanted” using the movie poster from the movie Office Space. A short while later we were contacted about a 600 square foot space above the Yaletown Brewing Company which became 6S Marketing’s first home. Our rent was cheap, but the place needed some new carpet and paint but the place was ours and it was beautiful with the stereotypical, brick & beam Yaletown look with a view over Hamilton and Helmcken Streets. Our company grew and a few years later we need more space and moved to an office on the other side of the building, now looking down at Mainland St.” Chris Breikss’ company is still a part of Yaletown’s business landscape and has won several awards over the years including “Best Company to Work for in British Columbia” (BCBusiness Magazine). 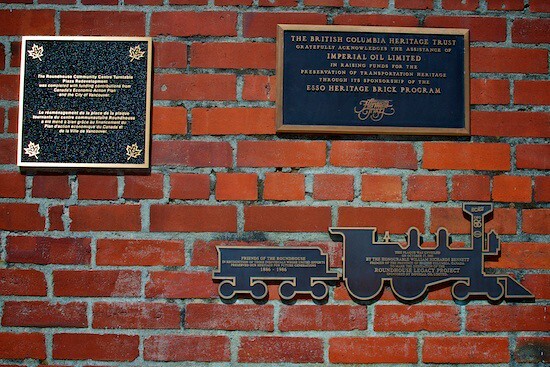 You can barely walk a block in Yaletown without spotting one of the City’s heritage plaques on the side building but its modern history began with rail. 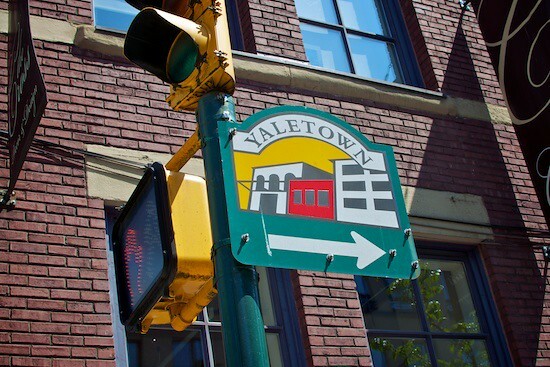 Yaletown is named after the town of Yale, at the start of the Fraser Canyon just past Hope, BC on the eastern side of the Fraser Valley. CPR workers were sent down to Vancouver from Yale to work on the rail line’s extension. 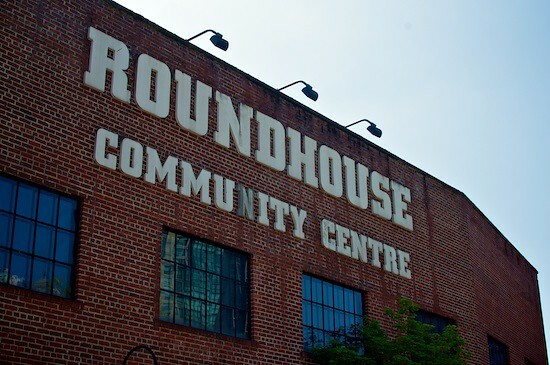 The importance of the railway’s historic terminus in Yaletown is evident at the Roundhouse Community Centre. 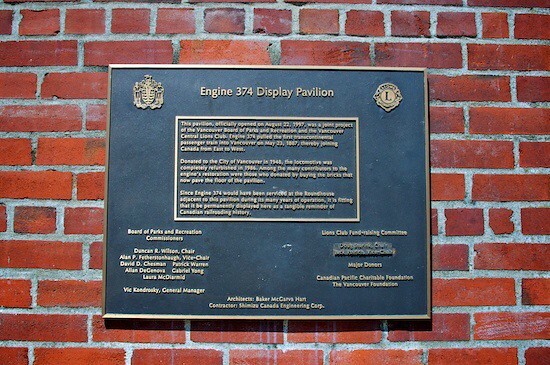 The giant turntable plaza is a relic from the days of the railway and within the Roundhouse you’ll also find historic Engine 374. 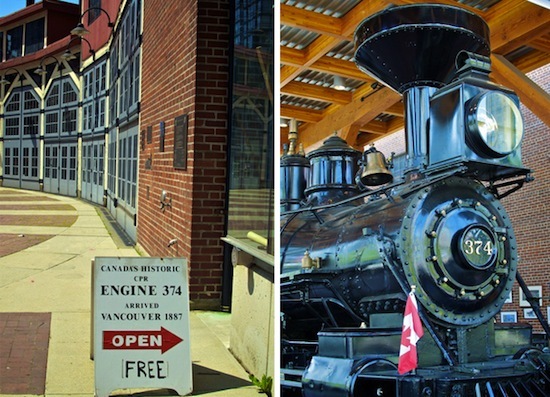 This giant, now housed in its own pavilion as a part of the Roundhouse Community Centre, pulled the first transcontinental passenger train into the city in 1887. It’s free to visit the engine’s pavilion which is chock-full of train facts, information (including timetables for current routes up and down the coast), and research from the West Coast Railway Association. Flavours and aromas mix and mingle like groups of young professionals enjoying a latte in the sunshine or a handcrafted cocktail after work. 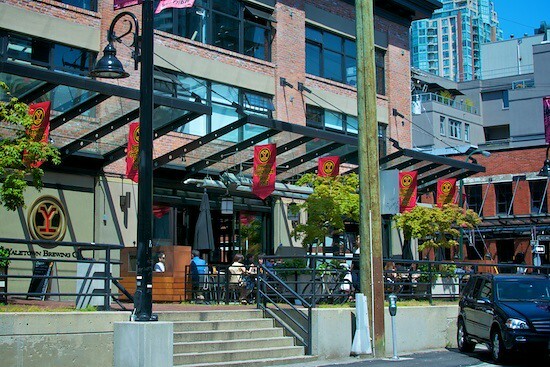 Restaurant options incude Provence Marinaside on False Creek, the beautiful brick courtyard at Brix, refreshing pints at Yaletown Brewing Company, Japanese Tapas at Hapa Izakaya, and much more. 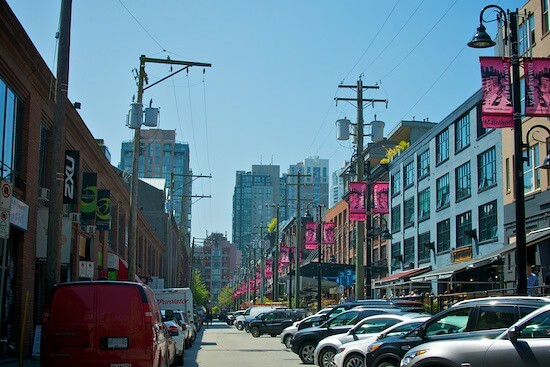 You won’t find any big box stores or major chains in Yaletown aside from a few convenience and drug stores. The rest are boutiques with fine fashions and unique furniture finds, galleries, bakeries, pet supplies, salons, and even a MINI dealership. When you’re visiting Yaletown you can stay at the OPUS Hotel, which has been voted one of the world’s Top 100 hotels by readers of Condé Nast Traveler magazine. It’s also home to La Pentola della Quercia bringing Northern Italian cuisine to the area for breakfast, lunch, dinner, and late-night snacking. 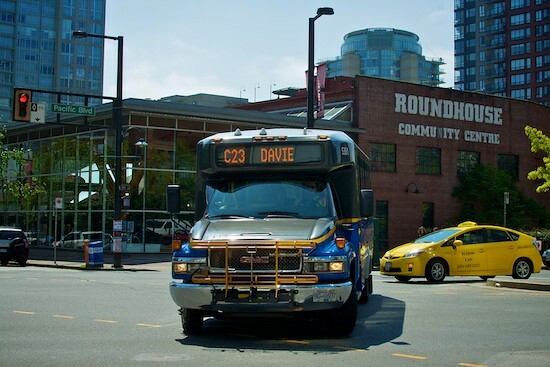 Community Shuttles from Translink offer cozy rides from Main Street, along Davie Street, down Beach Avenue, and over to Burrard. 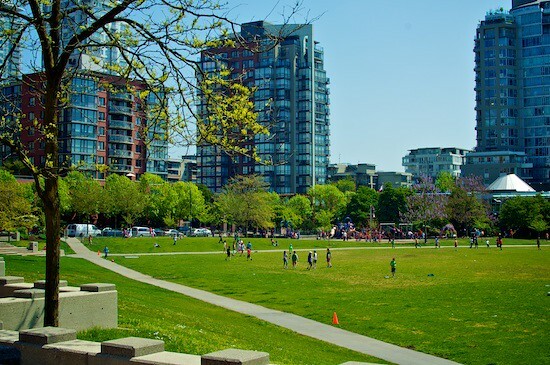 The #6 Davie bus also touches the tip of Yaletown when it stops at Emery Barnes Park. 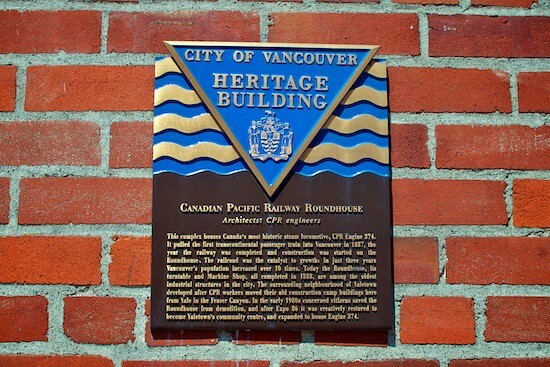 The most direct way to Yaletown is through the Roundhouse Canada Line Station that connects you to other parts of downtown Vancouver, Richmond, and YVR Airport. You can also take the Canada Line to Waterfront Station and transfer to the SkyTrain system to reach even further corners of the region. My favourite way to get to Yaletown is either to walk (up Nelson Street from our place in the West End) or hop on an Aquabus or False Creek Ferry water taxi to get to points along False Creek. In Yaletown you can experience a slice of Vancouver’s past while watching its future grow through forward-thinking business concepts. Mixed architecture spanning a century of design and waterfront green spaces make it a great place to live, work, and visit. I don’t know if I consider Yaletown a harmonious live/work community. Yes the area has been repurposed from its former self, but use as a live /work community has only be available to those at the top of the economic spectrum. 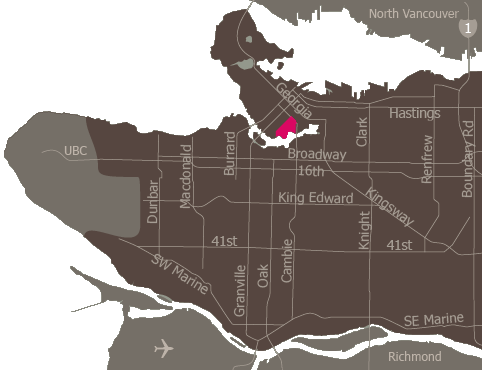 For the most part, Yaletown is geared towards the affluent where a thousand dollar haircut, bed sheets, designer dog jacket, and five dollar coffee can be enjoyed. 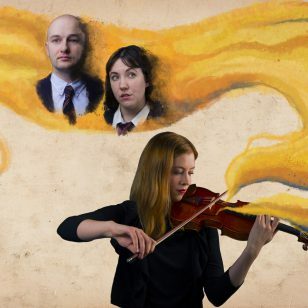 Yes there is a sprinkle of amenities for the commoner, but as with most redevelopment projects in and around the downtown core, gentification makes it just another playground for the hipster, yipsters and yupsters of this fine City. Sticks and stones, Jaime. Why the need to call names? If you took a few minutes to talk to the people you’re name-calling, you’d realize that Yaletown does indeed offer a very well -integrated work/live environment for everyone from business-owners and entrepreneurs to students and retail workers. Is aspiring to affluence or even achieving it such a terrible thing that you feel the need to name call or dismiss people who do? Name calling? I don’t recall addressing my comments specifically to Pauly D. Obviously you seem to identify and/or have an affinity for one of the terminological expressions I described and have taken personal offense. I apologize if my comments have inflicted any lasting psychological wounds and acknowledge some of us live in a bubble and must be treated delicately. The city that used to praise itself as multicultural, ethnically diverse and socially-mixed, has, become spatially divided into three distinct cities: the constant city of the rich, the shrinking city of middle-income households, and the growing city of concentrated poverty. As for your comment regarding aspirations of affluence. I don’t knock anyone wanting to better themselves. My issue is the Yaletown or Vancouver at large is not a resort-It’s actually a beautiful city that should be available to all, not just one social, economic or racial classification. One can pretend Yaletown offers inclusivity, but when you pull back the veil, there’s an entire different reality. Go have a a $5.00 coffee, $15.00 grill cheese and look for a $500 pair of aged jeans and relax buddy. Fist pump to you Pauly D! Oooh, I love it when you patronize me. It make my class oppressor guilt tingle. The politics of resentment aren’t worth anyone’s time, including mine. Bye now. Lol bravo Jamie. How does it feel to be owned Pauly?